Wild Republic is committed to providing the safest and highest quality toys for our customers. That’s why each of our toys goes through rigorous quality and safety control procedures to ensure their compliance with United States and international product standards. A nonprofit organization that accredits zoos and aquariums that have met rigorous standards in the protection of endangered species. A global organization that helps support zoos and aquariums in their efforts for animal care, environmental education and global conservation. An organization that works with a national network of nature centers, sanctuaries and scientific education programs to help create a world in which birds can thrive. A partnership with WAZA designed to increase environmental awareness and inspire people of all ages to take action for biodiversity. Click here to learn more about the Biodiversity is Us app that helps visitors learn about 400 animal species, take part in games and quizzes and more. A partnership with AZA that provides an opportunity for individuals to learn about the wetlands in their communities and listen to the calls of local frogs and toads. A partnership with The National Audubon Society that encourages young explorers to learn about different species of birds and their unique calls. A rescue and rehabilitation center for animals that are abandoned or destined to slaughter-houses. A safe place where hungry monkeys can go to be well fed. 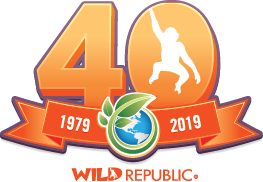 As a company committed to nature and conservation, Wild Republic proactively strives to be as environmentally friendly and ethically responsible as possible. From creation to consumption, we strive to lessen our carbon footprint by reducing, reusing, and sourcing sustainable products. We strive to preserve natural resources and minimize deforestation by selecting alternative natural sources for our products. We strive to protect and preserve wildlife, natural habitats, and eco-systems through environmentally conscious and recyclable packaging. Wild Republic strives to reduce unnecessary waste by developing high quality, affordable products that will last for generations to come. It is our mission to foster an environment where nature inspires our children to preserve and protect our planet for generations to come.